I know, it's a clunky title. But I couldnt come up with a better description in English for pulikachal, which would translate from the Tamil literally into "tamarind (puli) boil-up (kachal)" - descriptive enough but not particularly useful informative. I dont make pulikachal very often because there's always the impression at the back of my mind that it takes too long to make, and now that I'm working full-time, there doesnt seem to be enough free time to do all the things I want, let alone spend lots of time on just cooking. 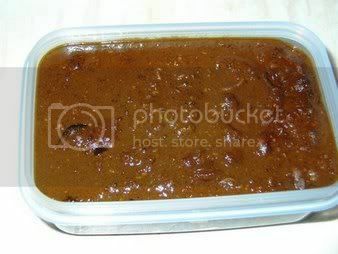 But the impression is not quite right, because once the masala has been made for it, pulikachal kind of cooks itself. It doesnt need looking after every single minute. The best pulikachal I've ever had was when I was an apprentice sub-editor at the Indian Express, my very first job. My boss (and mentor) there was a wonderful old gentleman called C P Seshadri, fondly and universally known as "Master". He was a very knowledgeable person, a living bit of history - a contemporary of Mahatma Gandhi, Pandit Nehru and all the other stalwarts of the Indian freedom movement... and what is more, he was personally acquainted with them. His wife (Mrs Master to me) was a very dignified, stern looking lady - but in reality very kind. Not to mention, a SUPERB cook. Everything she made was wonderful, but her tamarind rice was out-of-this-world good. Iyengars are traditionally considered to make the best pulikachal and I have to say that Mrs Master was living proof of that. I wish I'd been interested enough in cooking then to ask her for the recipe. That said, though, I've evolved a pretty good recipe for pulikachal, based - but of course - on my mother's. My version has coconut in it (and yes, I do realise that for someone who doesnt like coconut in a lot of things, I seem to be using the stuff rather a lot!). Anyway, while trawling through the Net a couple of years back, I came across a comment in some food-chat board that said the writer added toasted grated coconut to the masala for pulikachal. After a lot of thought - and a great deal of hesitation - I decided to follow that tip. And what a surprise to find that the coconut adds texture but doesnt register on the palate... and you cant smell it either. JUST the ticket. No more babbling for now - here's my recipe! 1. Roast all the masala ingredients (except the coconut) in one tsp of oil till the seeds pop and the dals become a lovely golden brown. Set aside to cool. 2. 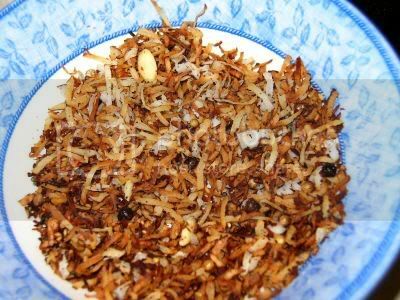 Roast the grated coconut separately, turning it over frequently, till it turns golden brown. Let it cool as well. 3. In a coffee grinder or spice grinder, grind the roasted masala ingredients and the coconut to as smooth a paste as possible. This might be easier done a little at a time, because the resulting paste is very thick. Dissolve the paste in a cupful of water and set aside. 4. In a wide but deep vessel, heat 3 tsp oil. Add a pinch of asafoetida (optional), then all the tempering ingredients and cover till the seeds finish popping. 5. Pour in the 6 cups of tamarind water and stir. Let the water come to a rolling boil, then stir in the ground masala paste, mixing till well incorporated. 6. Leave the heat on high and cook the mixture till it reduces to a third and starts thickening. Add salt to taste now. (The reduction could easily take 20 minutes or more, depending on the depth and width of the pan. Basically, the deeper the pan, the longer the time). 7. When the pulikachal is thick (the consistency of honey, more or less), turn the heat off. It will become thicker still as it cools. Pulikachal can be used to make tamarind rice - about a tbsp mixed with a cupful of cooked rice, but you can add more or less depending on taste. This recipe makes quite spicy pulikachal. I love it too! I like it even more when I dont have to make it myself :) Hope you enjoy the recipe, Sailu! Delicious! I love to eat pulikachal with curd rice and dosa too. My mom makes it this way but coconut in it is new to me. But I have seen a lot of recipes use only a powder of pepper, chilies and fenugreek. I love this chatty post. And I adore tamarind ~ thanks for using the concentrate! Hi Courtney - thanks for calling this post "chatty" - it's a kind description! :) I like using tamarind concentrate... saves on a lot of time! Shammi, I loved the foreward narration. I drolled on reading the Iyengar puliyodharai. Don't know if you had been to Chidambaram Natarajar temple. There is this Lakshmi sannidhi where Puliyodharai, thayir saadham, sakkarai pongal is served - all on Lotus leaves. Typical Iyengar taste (as you might have known, the temple has got both Saivaite and Vaishanavite shrines). And ofcourse I *did* wonder on the coconut part! You were bang right on the comment - for a person who dislikes coconut so much, I am seeing a lot of them on your receipes these days ;-) My mom has a mixutre of dhania-sesame powder to be sprinkled on the rice at the end. We use chopped copra (dried coconut), peanuts and puttani/dalia/kadale (the one indira calls puppula) in the seasoning along with the usual stuff you mention. 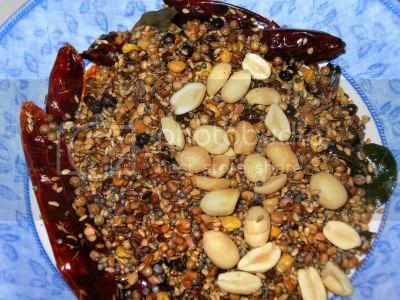 VERY NICE RECEIPE, ONLY CHANGE I MAKE IN TAMPERING I USE ONLY MUSTARD SEEDS, RED CHILLIES AND PEANUTS, AS WE ARE USING ALL OF THEM IN POWDER. ALSO WHEN PREPARE RICE OR AVIL, ONE HAS TO REMOVE LESS THINGS IN THE SIDE PLATE, LIKE THOSE CHILLIES, CURRY LEAVES MOST OF THEM DO NOT EAT ALL THOSE.